When you think of powerpop/punk in the 2010s, the Steve Adamyk Band ought to be one of the first bands that comes to mind. Adamyk was there at the beginning of the decade, and he's still here at the end. Out on Dirtnap Records, Paradise is now the sixth SAB album (and first in three years). It's the first to feature the band's most recent three-piece lineup with Pat Johnson of The Acorn and Johnny O of Uranium Comeback backing singer/guitarist Adamyk. Spoiler alert: it rocks! First things first: Paradise sounds like a Steve Adamyk Band record! No one's going to hear this album and be like, "Whoa! They really changed their sound!". And thank God for that. I'm not saying that Steve Adamyk invented powerpop/punk, but he was one of the individuals most responsible for defining what that genre would become in the present decade. 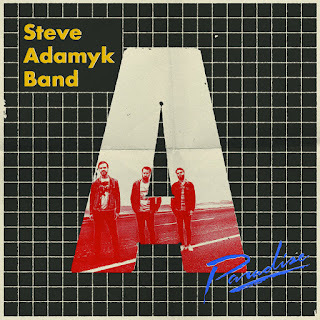 A Steve Adamyk Band record that deviated from the basic formula of power pop influenced punk rock would just seem...wrong! Certain SAB albums have leaned more "pop" or "garage", but the band has never wavered from its general musical style. Paradise, for the lack of a better term, is quite possibly the "punkest" of the band's six albums. Recorded by Mike Bond and mixed by Jesse Gander, this is a huge-sounding album that really punches up the guitars and vocal harmonies. Locked in tight with his latest rhythm section, Adamyk just sounds like a guy who's super inspired to play some fast and tuneful punk rock! There's a palpable Ramones influence propelling "In Death" and the ripping title track. The band has never sounded more powerful or purposeful as it does on "Waiting To Die Part 2". "No Help", in the vernacular of the modern-day punk rock reviewer, is positively crackling! But don't go thinking that Adamyk has come to the table without some goodies for you pop people as well. "Take It To The Top" is powerpop/punk played right down the middle: the sort of song that Adamyk should never stop writing since he's just so damn good at it! "When I Was Gone" and a fine cover of The Kidda Band's "Get Off The Telephone" swing all the way to the power pop side and are total crowd pleasers. "Left In Pieces", which manages to mash the Beach Boys and new wave pop into the band's core sound, is one of this record's true gems. There are few better than Steve Adamyk at turning out high quality poppy punk tunes. And my takeaway from Paradise is that his passion for creating this type of music has never been stronger. It goes without saying that anyone who has bought all of the band's previous albums will love Paradise as well. But I'll take it a step further: if the sixth Steve Adamyk Band album is somehow your first, it will make you want to own the other five! Dboy - "Dboy for President"
The Chats - "Pub Feed"
Gentleman Jesse & His Men - "Bryan"
Wild Zeros - "Teenage Lifestyle"